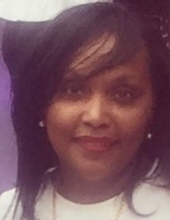 Mrs. Carla Mariea Cohens Heard, 56, of North Little Rock, AR departed this life on Saturday, January 12, 2019. She was born February 18, 1962 in Conway, Ar to the late Bennie Cohens, Sr. and Mattie Louise Pace-Cohens. She is preceded in death by her parents and brother Jerry Dwight Stubbs. Carla loved to love on people. She was a wonderful, vibrant being that was cherished by those who loved her. It was no secret that Carla was a dedicated mother first and foremost. She treasured her children and embraced every moment with them. She had a vivacious personality and always made those around her smile. In her final days, Carla was very excited about her future, but will now serve as our guardian angel whose life and legacy will never be forgotten. Carla leaves to cherish wonderful memories to her husband Myron Heard, Sr.; daughters Carmen Garrett and Charmin White of Chicago, IL; five brothers Royce Larry (Penny) Pace of North Little Rock, AR; Bennie (Pennie) Cohens, Jr. of Little Rock, AR; Edwin Cohens of California; Brian (Chrystal) Cohens, Sr. of Jacksonville, AR and Sheldon Cohens of North Little Rock, AR; one sister Candice Cohens of Jacksonville, AR and a host of other relatives and friends. Funeral services will be held 10:00 am, Saturday, January 19, 2019 at Rock of Ages Missionary Baptist Church, 8112 Bicentennial Road, North Little Rock, AR. Visitation one hour prior to service. Interment Perkins Park Cemetery in North Little Rock, AR. To send flowers or a remembrance gift to the family of Carla Mariea Cohens-Heard, please visit our Tribute Store. "Email Address" would like to share the life celebration of Carla Mariea Cohens-Heard. Click on the "link" to go to share a favorite memory or leave a condolence message for the family.